Australian War Heroes – Can You Hear Australia's Heroes Marching? Australian War Heroes Song - Can You Hear Australia's Heroes Marching? The song is timeless and honours the memory of those who have died in the service and defence of Australia in war. The marching theme of the song is especially powerful and supports the spirit of ANZAC Day. The song does not glorify war or endorse conflict of any kind. The song simply highlights the sacrifice of many Australians who died in the service and defence of our country in war. The song has been used for commemorative purposes across Australia by schools, churches, choirs, bands, councils, retirement homes, military services, radio stations, RSL branches and ANZAC tributes at NRL & AFL matches. The song is also requested to be used at veteran funerals. Our YouTube Channel has over 3 million video views, with most viewing videos relating to the popular song. The song is suitable for ANZAC Day and Remembrance Day. The ANZAC Centenary 2014 – 2018, highlighted by the centenary of the landing at Gallipoli on April 25, 2015, is a very special time for Australia. You can now download the original version of “Can You Hear Australia’s Heroes Marching?” for free at the song’s download page on this website. The original version of the song was recorded in March 2001. You can also download a 4 minute version of the song recorded in March 2001 for free. The song has touched many people’s hearts over the past 17 years, and at this very special time in Australia, the author and copyright owner of the song has made the song available for free. 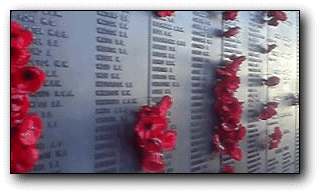 Also, the featured video on the song’s download page, titled “Free ANZAC Day Video – With Australian War Heroes Song”, can be used for commemorative purposes for free, without the need to ask the author and copyright owner for permission. The video cannot be altered or changed in any way. If you haven’t yet visited the Australian War Memorial in Canberra, then it’s highly recommended that you do. The Australian War Memorial commemorates the incredible sacrifice of men and women who have served Australia in war. It is a place where you can fully appreciate the cost of war and its effect on the lives of many Australian families throughout our history. If you are into Australia’s history, there is no better museum where you can see our war history in great detail.